What cannot but strike the eye in the revolts in Tunisia and Egypt is the conspicuous absence of Muslim fundamentalism. In the best secular democratic tradition, people simply revolted against an oppressive regime, its corruption and poverty, and demanded freedom and economic hope. The cynical wisdom of western liberals, according to which, in Arab countries, genuine democratic sense is limited to narrow liberal elites while the vast majority can only be mobilised through religious fundamentalism or nationalism, has been proven wrong. The big question is what will happen next? Who will emerge as the political winner? When a new provisional government was nominated in Tunis, it excluded Islamists and the more radical left. The reaction of smug liberals was: good, they are the basically same; two totalitarian extremes – but are things as simple as that? Is the true long-term antagonism not precisely between Islamists and the left? Even if they are momentarily united against the regime, once they approach victory, their unity splits, they engage in a deadly fight, often more cruel than against the shared enemy. Did we not witness precisely such a fight after the last elections in Iran? What the hundreds of thousands of Mousavi supporters stood for was the popular dream that sustained the Khomeini revolution: freedom and justice. Even if this dream utopian, it did lead to a breathtaking explosion of political and social creativity, organisational experiments and debates among students and ordinary people. This genuine opening that unleashed unheard-of forces for social transformation, a moment in which everything seemed possible, was then gradually stifled through the takeover of political control by the Islamist establishment. Even in the case of clearly fundamentalist movements, one should be careful not to miss the social component. The Taliban is regularly presented as a fundamentalist Islamist group enforcing its rule with terror. However, when, in the spring of 2009, they took over the Swat valley in Pakistan, The New York Times reported that they engineered "a class revolt that exploits profound fissures between a small group of wealthy landlords and their landless tenants". If, by "taking advantage" of the farmers' plight, the Taliban are creating, in the words of the New York Times "alarm about the risks to Pakistan, which remains largely feudal," what prevented liberal democrats in Pakistan and the US similarly "taking advantage" of this plight and trying to help the landless farmers? Is it that the feudal forces in Pakistan are the natural ally of liberal democracy? The inevitable conclusion to be drawn is that the rise of radical Islamism was always the other side of the disappearance of the secular left in Muslim countries. When Afghanistan is portrayed as the utmost Islamic fundamentalist country, who still remembers that, 40 years ago, it was a country with a strong secular tradition, including a powerful communist party that took power there independently of the Soviet Union? Where did this secular tradition go? And it is crucial to read the ongoing events in Tunisia and Egypt (and Yemen and … maybe, hopefully, even Saudi Arabia) against this background. If the situation is eventually stabilised so that the old regime survives but with some liberal cosmetic surgery, this will generate an insurmountable fundamentalist backlash. In order for the key liberal legacy to survive, liberals need the fraternal help of the radical left. Back to Egypt, the most shameful and dangerously opportunistic reaction was that of Tony Blair as reported on CNN: change is necessary, but it should be a stable change. Stable change in Egypt today can mean only a compromise with the Mubarak forces by way of slightly enlarging the ruling circle. This is why to talk about peaceful transition now is an obscenity: by squashing the opposition, Mubarak himself made this impossible. After Mubarak sent the army against the protesters, the choice became clear: either a cosmetic change in which something changes so that everything stays the same, or a true break. Here, then, is the moment of truth: one cannot claim, as in the case of Algeria a decade ago, that allowing truly free elections equals delivering power to Muslim fundamentalists. 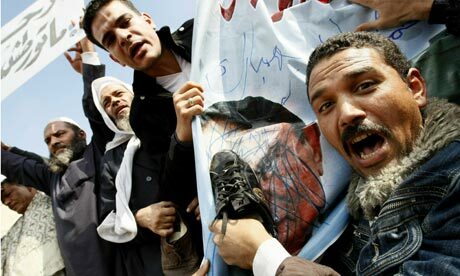 Another liberal worry is that there is no organised political power to take over if Mubarak goes. Of course there is not; Mubarak took care of that by reducing all opposition to marginal ornaments, so that the result is like the title of the famous Agatha Christie novel, And Then There Were None. The argument for Mubarak – it's either him or chaos – is an argument against him. The hypocrisy of western liberals is breathtaking: they publicly supported democracy, and now, when the people revolt against the tyrants on behalf of secular freedom and justice, not on behalf of religion, they are all deeply concerned. Why concern, why not joy that freedom is given a chance? Today, more than ever, Mao Zedong's old motto is pertinent: "There is great chaos under heaven – the situation is excellent." Where, then, should Mubarak go? Here, the answer is also clear: to the Hague. If there is a leader who deserves to sit there, it is him.